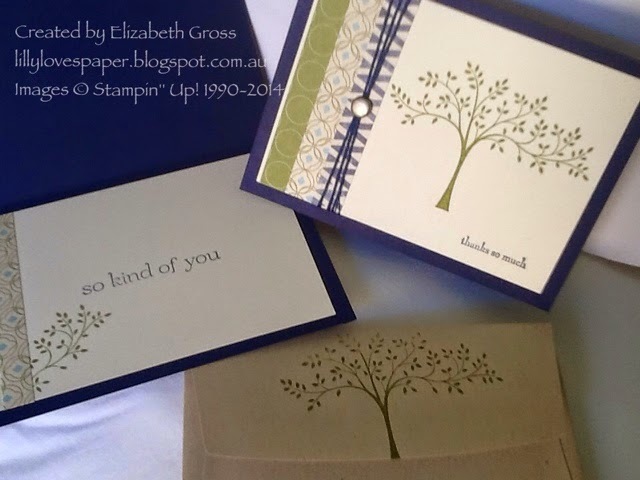 Stampin ' Up! 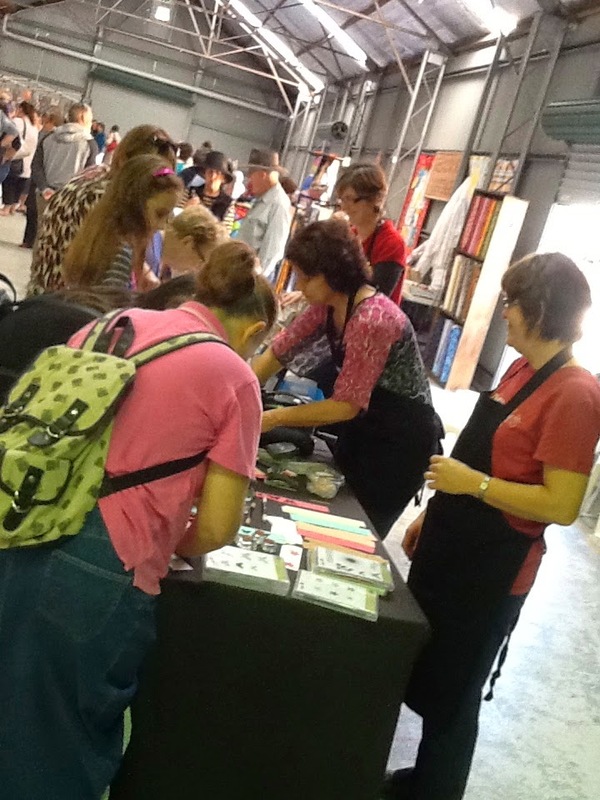 stand at the CQ expo this weekend is manned by myself and 3 other demos. We have been having a great weekend. 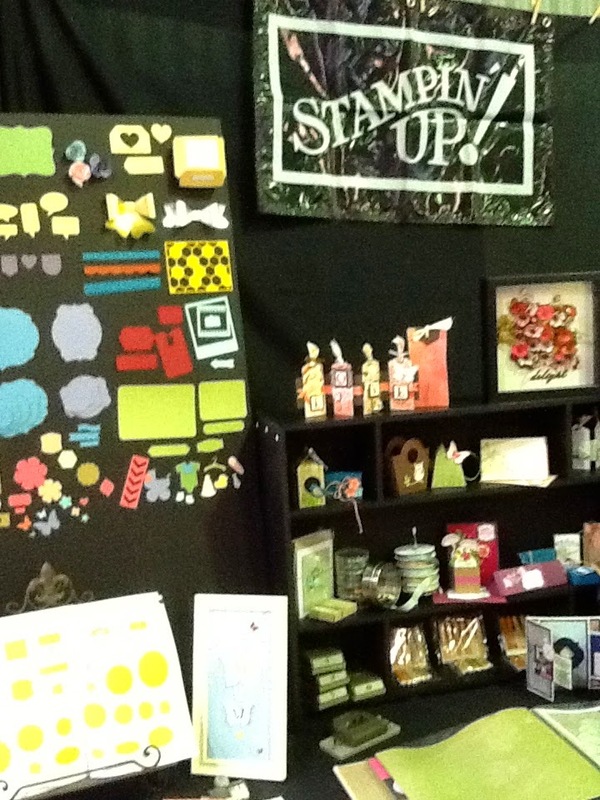 These are a few photos of our stand. Thanks to Kristina, Joanne and Sue for all their hard work. Playing with the circle thinlits cards- making some samples for the CQ Craft Expo this weekend. These are 2 of the new colours Hello Honey and Blackberry Bliss. They are so rich and striking. The new clothes pins come pre printed, we were given some of these at convention. I didn't think I would worry about getting any but in real life they are fun to use. I added a little bit of stitching too which was fun. The perle embroidery cotton to match comes from my good friends Di and Sloan at needlework cottage. They are walkways so helpful matching colours. 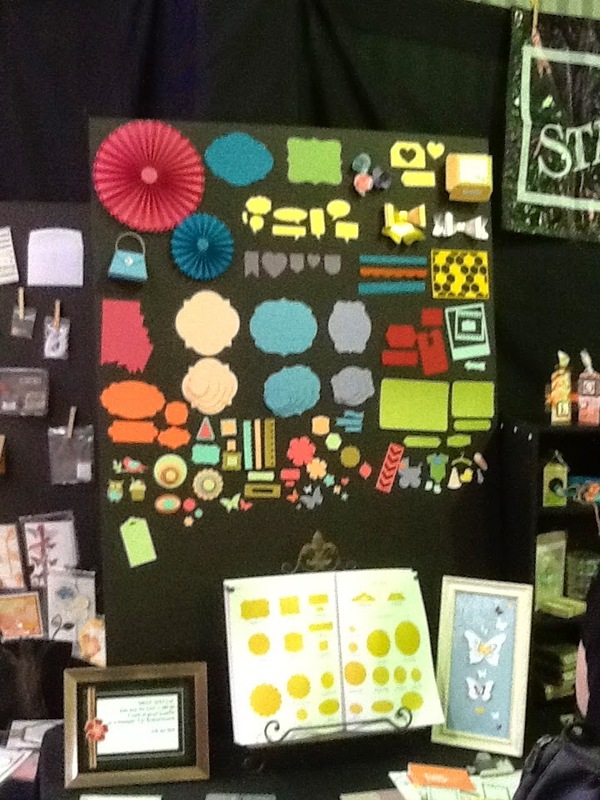 They will be at the craft expo this weekend too. The Handmade Expo Markets are on again this weekend and I have been busy creating some more scallop tag topper cards. The first was for a young friend's birthday and shows how they can be personalised, but the others are a few of what is for sale this weekend. I am quite proud of the little boxes I made for them to go in- using my Envelope Punch Board of course! 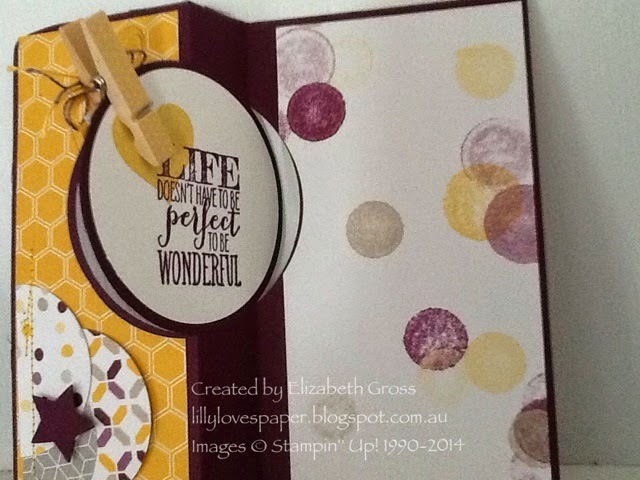 The retiring In Colours are the inspiration for this latest challenge from Just Add Ink. They are some of my favourite colours so it was not hard to make card using them as the focus. In fact I have been using these colours a lot lately trying to use up some of the DSP. the problem in fact is in deciding which card to enter! 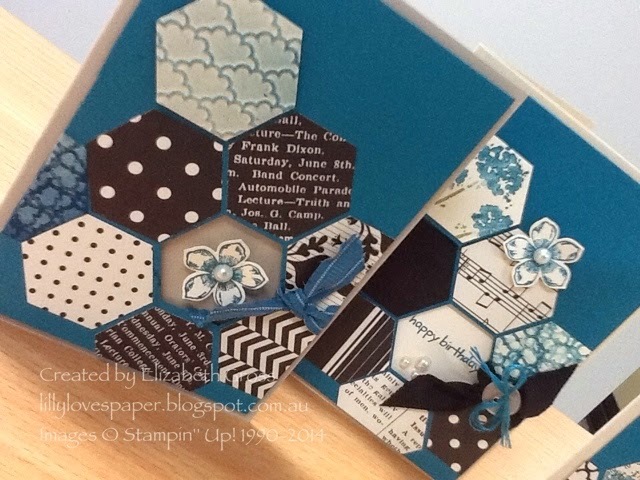 I love patchwork cards and my previous designs used the 1" square, but I have made the latex ones using the hexagon punch.. After they are adhered to the base square I run them through the Bigshot with an Embossing Folder to give the look of a quilted piece before embellishing. These ones use Midnight Muse, Gumball Green and Summer Starfruit. 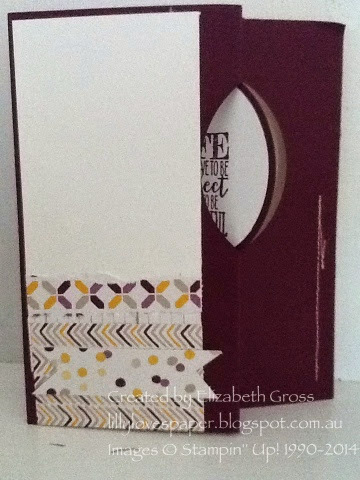 My other card for this challenge is a flower Box card - it stands up like a flower box but folds flat to fit inane envelope- however it is not as bulky as a card in a box. I have taught these in a class and they were very popular. 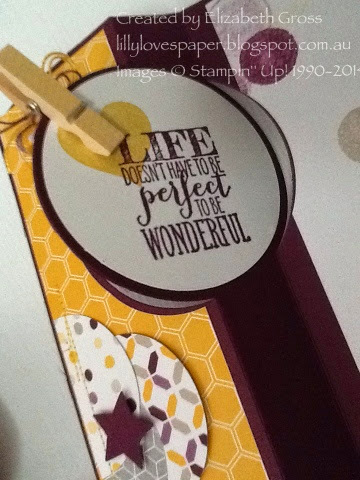 I have been playing with the Scallop Tag Topper punch- which I love - and found some inspiring pictures on Pinterest (Of course!!). I quite like the Love card made byLeanne Pugliese here at Wee Inklings, so i have made one too. I have used Early Espresso Cardstock and ink, and Tangerine Tango ink, with DSP from the Venetian Romance set. I can't believe it has taken me nearly a whole year to get some of this paper, it's so beautiful, and now it is going to retire in only a few weeks. You can order your set from my online store. made a rolled rose flower with some print DSP and a pearl centre. 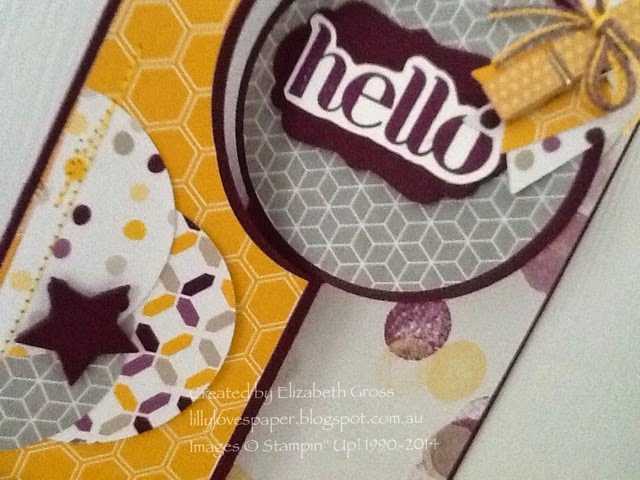 Have been playing with the circle thinlits framelits preparing for a workshop at the upcoming Central Queensland Craft Expo, and have been enjoying using the set to be released soon called "Kinda Eclectic". It's a really versatile set and I love it. 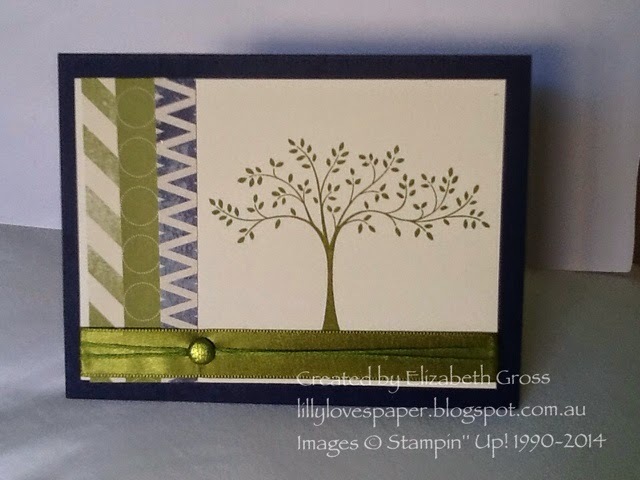 I am of course a bit partial to leaves so this is a great set for me, and I am finding the other elements really easy to use in all sorts of designs. One of the sets of 5 cards which I sell boxed at the markets. It's always good to have some thank you cards in the cupboard and these are quite versatile - and not a butterfly or a flower in sight! DSP from the "Etcetera" collection to add some depth to the Vanilla card fronts. I have used matching embroidery floss ( both olive and navy) wrapped around the card front and embellished with an Olive Glimmer Brad - wish I had a few more of these.... On the navy cards I used a regular brass paper fastener from the newsagents which I have dipped in versamark ink and Pewter embossing powder. The heat embossed metal brad works really well though it is a lot bigger than the craft variety. 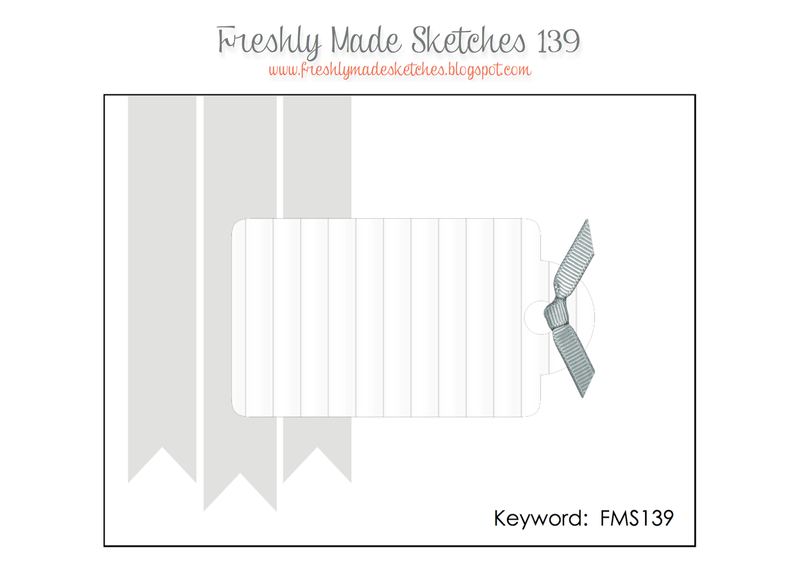 I always decorate the inside of my cards to match the front and I also stamp the envelope to match. Last of the hexagons for a while! After attempting to put some multicoloured hexagon cards together I went back to the basics! Modern Medley black and vanilla with one other colour still seems to be my favourite. 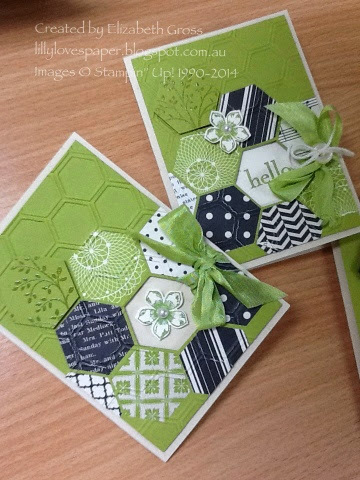 However I didn't have much DSP in the Lucky Limeade tones so I improvised by stamping the Thoughts and Prayers Tree onto cardstock and Clear Embossing it, this gave just enough "lift" to the hexagon for a feature tile. for the Island Indigo feature tiles I did some stamping using one of the flowers from the Best of Flowers set. We made these at my last card class and I had fun finishing off the leftovers. 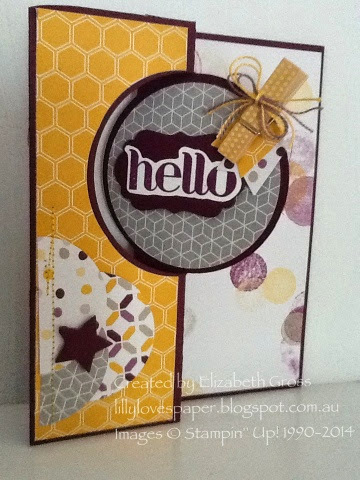 On a few of them I ran the completed piece through the hexagon embossing folder for a bit more texture.